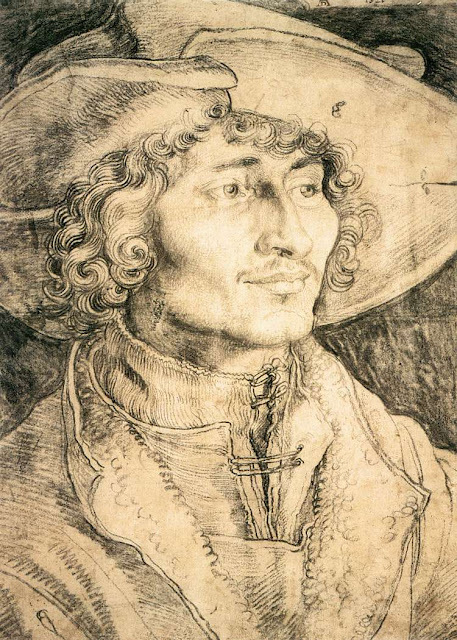 Two paintings by Albrecht Dürer which reveal two ways of listening. 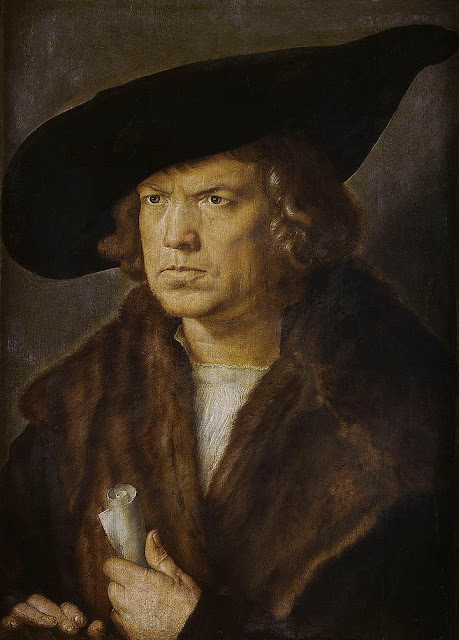 The gentleman above has a closed face, clutches a sheaf of papers in his left hand and covers his right ear with his hat, while the gentleman below has an open face, and covers his left ear with his hat. From the perspective Alred A. Tomatis, these two paintings illustrate the difference between left and right ear laterality. Some may believe this depiction to be arbitrary, but experience in the studio has shown me that it is not. The young student who's had a really, really bad day, and arrives only to say that they can't quite get their voice together? Which face do you think I see before my eyes? The one above, or the one below? /i/ has the potential to wake up the right ear with ringing vibration, while it will be noticed that the uneducated /u/ will tend to go towards the left—the mouth literally pointing in that direction. Interestingly, I've known a singer or two to be positively bi-polar in this regard, the mouth pointing back and forth between these two vowels, the vocal line jerking this way and that. Interestingly, it will be noted that the vowel between /i/ and /u/ is /a/, which Francesco Lamperti considered the father of all vowels. It is a difficult vowel for many, and reveals everything. Not forgotten is my own experience at the Listening Centre in Toronto in this regard. As my mixed-dominance was addressed by being stimulated with high frequencies via bone and air conducted sound, I saw my face open at the level of my upper lip, which became broad and wide, while my lower jaw released back and down. I realized immediately this expression, or affect, if you will, as the /a/ I had been taught by my teacher, who had been taught it herself by a musical daughter of the Garcías. I saw it in others too, especially in the face of a troubled red-headed kid, who greeted me as I came up the stairs into the Centre one day, his worried down-cast face utterly transformed: open, radiant, and alive. I thought to myself: "Wow…you have a future." To put matters simply, the open face reveals the audition of high frequencies, the facial nerve inserting into the middle ear via the stapedius muscle, which is connected to the stirrup. According to Tomatis, the right ear processes—actively speaking—higher frequencies faster than the left, which begs the question: can you grin like a maniac, or actively try to widen your upper lip through mechanical means, and open your ear? No. But you can remember something wonderful and smile—a very different thing. The Old School insisted that the singer had to master the /a/ vowel for the voice to come forth. My own teacher would say: "We sing in the position of /a/." She would also say that you have to "start where you are going," which, in terms of this discussion, simply indicates that the professional singer does not have time to dilly-dally (truth to tell, she was also talking about placement). You have to know what to do, and how to do it quickly. That's the thing really. As I see it now, the young singer who takes forever to find their voice simply has trouble awakening their ear, which often explains why the student can do things in the presence of the teacher, especially one who can demonstrate correct tone production, but can't do it in their own practice. Once the stimulus is gone, the vocal behavior disappears as well. Lilli Lehmann wrote in her book How to Sing that it look students 6 months to learn how to listen. More and more I believe she was right.